The discovery was made by James Clark, the Ronald B. Weintraub Professor of Biology, in the Department of Biological Sciences of GW's Columbian College of Arts and Sciences. 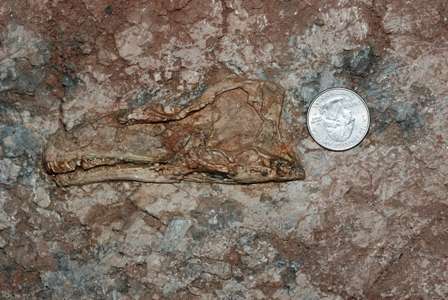 Dr. Clark, along with his then doctoral student Jonah Choiniere and a team of international researchers, found the dinosaur specimen in a remote region of Xinjiang in China in 2006. In a research paper published in the Journal of Systematic Palaeontology, Drs. Clark and Choiniere explain recovering the skull, mandible and partial skeleton of the dinosaur. The new theropod was an estimated 1 meter or just over 3 feet long and probably weighed about 3 pounds. "All that was exposed on the surface was a bit of the leg," said Dr. Clark. "We were pleasantly surprised to find a skull buried in the rock too." The dinosaur is named Aorun zhaoi, after the Dragon King in the Chinese epic tale Journey to the West. It wasn't necessarily a small dinosaur species, though, because Aorun was still a youngster when it became a fossil. "We were able to look at microscopic details of Aorun's bones and they showed that the animal was less than a year old when it died on the banks of a stream," said Dr. Choiniere. Dr. Choiniere, now a senior researcher at the Evolutionary Studies Institute at the University of the Witwatersrand in Johannesburg, South Africa, was a doctoral student in Biological Studies at GW when the discovery was made. He was also a Kalbfleisch Fellow and Gerstner Scholar at the American Museum of Natural History. Aorun lived more than 161 million years ago, in the earliest part of the Late Jurassic Period. Its small, numerous teeth suggest that it would have eaten prey like lizards and small relatives of today's mammals and crocodilians. This is the fifth new theropod discovered at the Wucaiwan locality by the team, co-led by Dr. Clark and Dr. Xu Xing of the Chinese Academy of Sciences.